This combination screams with goodness! 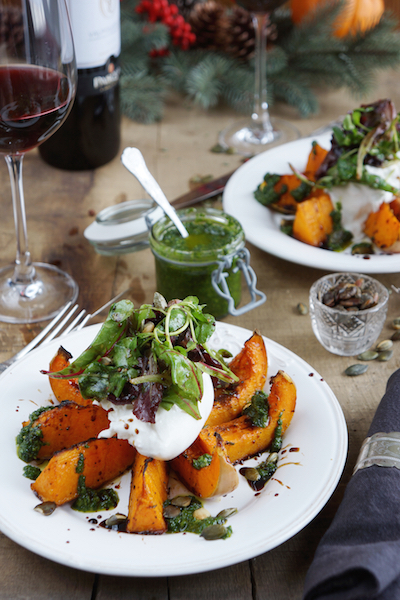 The sweet roasted butternut squash blends perfectly with the creamy burrata and basil oil, allowing you to indulge your ‘autumny’ side with minimal effort. Inspiration for this dish came from a dinner at 10 Greek Street in London – an unpretentious little restaurant with a small choice of dishes that change daily, depending on what’s fresh. I was especially thrilled with their wine list – great wines at incredibly affordable prices. 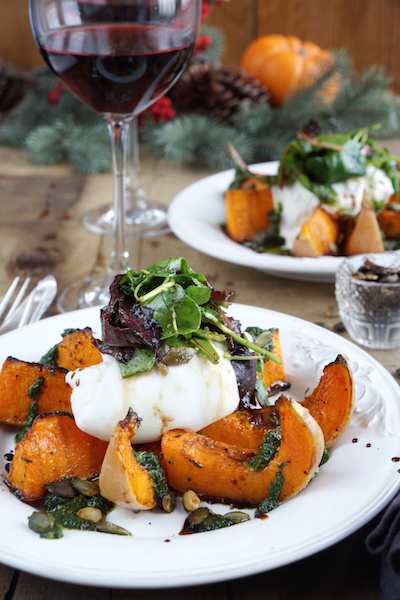 Their roasted butternut squash with burrata reminded me of Ottolenghi’s spicier version with chilli yoghurt – time to get creative! Every October we put ‘Jack-o’-laterns’ outside on our porches to ward off ghosts. This custom comes from an Irish folktale about Stingy Jack who goes for a drink with the Devil (the way you do). Living up to his name, Jack doesn’t have any money with him and asks the Devil to transform himself into a coin. The devil agrees but finds himself in Jack’s pocket next to a silver cross and therefore unable to transform himself back. The Devil eventually agrees to leave Stingy Jack in peace for a year and not to claim his soul after death. A year later the Devil agrees to climb on a tree to get a fruit, Stingy Jack quickly carves a cross into the tree so that the Devil gets stuck again (eternity doesn’t necessarily make you smart)! The Devil then agrees to leave Stingy Jack in peace for another 10 years in exchange for his freedom. Soon after Stingy Jack dies. God, not being pleased with Stingy Jack, doesn’t let him enter heaven. Jack turns to the Devil, who decides to stick to his promise not to claim Stingy Jack’s soul. He gives him a burning coil on his way into the dark which Stingy Jack puts into a hollowed turnip. Since then he has wandered the earth looking for a place to rest in peace. The Irish and Scots started to put carved turnips, potatoes and beets with scary faces on their porches to keep wandering Stingy Jack and other unpleasant ghosts away. Don’t mess with the Gods! Irish immigrants took this custom with them to America where the pumpkin was, true to the American Dream, chosen as a more bigger ’n better Jack-o’lanterns’. 1. Preheat the oven to 220ºC/200ºC Fan; 430ºF/390ºF Fan. 2. Discard the seeds of the squash. Cut into 2cm/04.in-thick and around 5cm/2in-long wedges. Leave the skin on. Place into a bowl with the thyme and olive oil. Season with salt and pepper. Mix well so that everything is coated. 3. 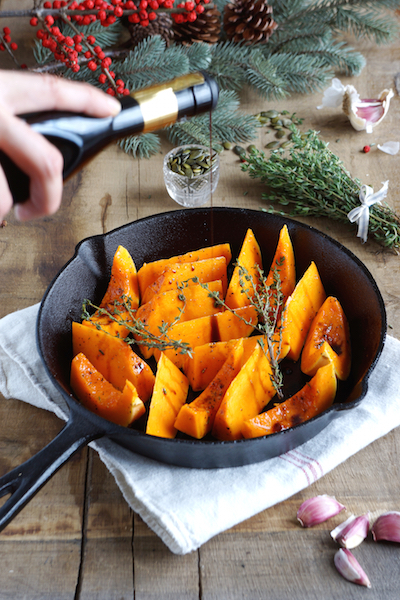 Place the squash on a baking tray or a skillet. Drizzle with the aged balsamic vinegar. Bake for 30-40 minutes until coloured and soft – test with a knife. If the squash gets too coloured but is not yet soft, cover with aluminium foil! 4. While the squash is in the oven, place the pumpkin seeds on another baking tray, put them in the oven on a level below the squash. Roast them for around 5 minutes until they pop. Take them out and let them cool. 5. Put the basil, olive oil and salt into a food processor. Blitz until you get a fine paste. Set aside. 6. Place all the ingredients for the dressing and a splash of water in a bowl, season to taste – mix well. 7. Assemble the warm squash wedges on the plates in a flower formation. Cut the burrata with a spoon in 2 – lay the burrata in the middle across the wedges. Mix the salad with 2 tbsp of the dressing. Lay on top of the burrata. Drizzle with the basil oil and aged balsamic. Sprinkle the pumpkin seeds on top. Cut the burrata with a spoon or with your hands to make it look more natural. 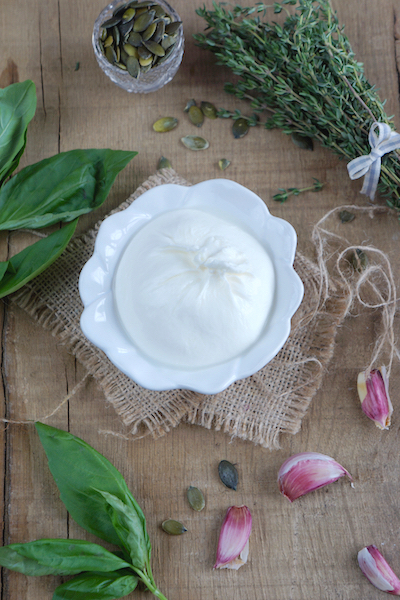 In case you cannot find burrata, use good quality of mozzarella di buffala. If you don’t have aged balsamic vinegar, take your normal balsamic and reduce it to half. 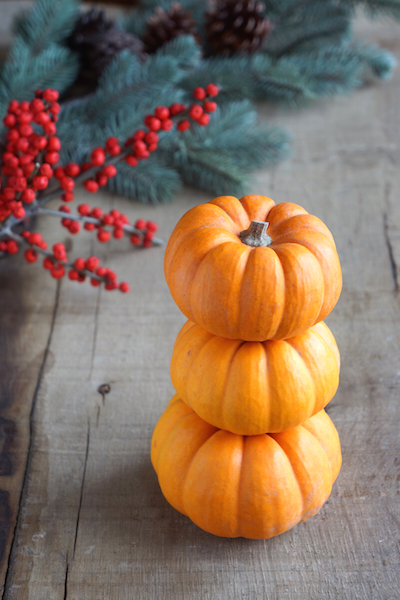 Use pumpkin instead of butternut squash. Why not adding some spice? 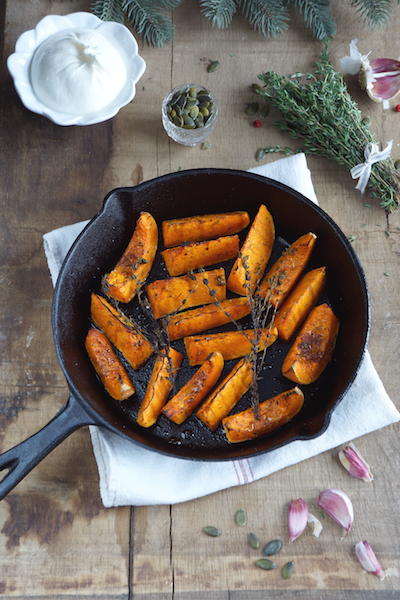 Add chilli flakes and garlic to the butternut squash before putting it in the oven. White plates; white sunflower bowl; cast iron skillet; tea towel. Cutlery and little glass bowl from Covent Garden Antique Market. This entry was posted in Food, Food Photography, Food Styling, Recipes and tagged dressing, photography, restaurant, salad, vegetarian by Françoise La Prune. Bookmark the permalink. Looks great! I’m going to try this recipe.